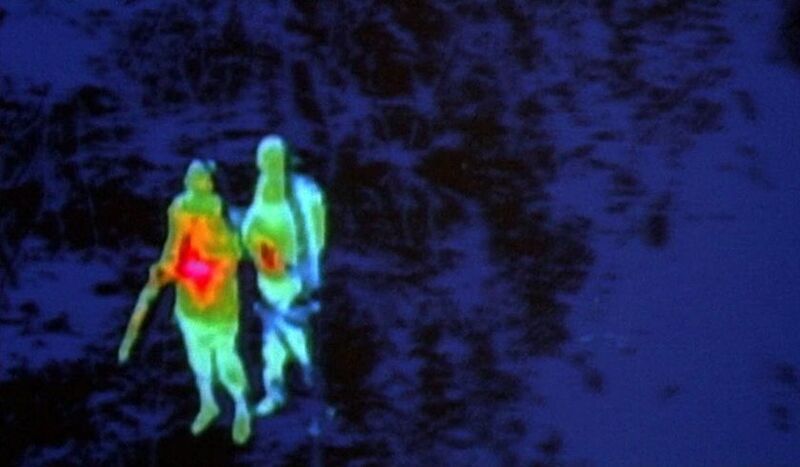 For most people the first peek at thermal imaging were the scenes from the 1987 movie Predator with Arnold Schwarzenegger where the alien used thermal vision to track his prey. Interestingly enough this was probably the first movie to use an actual thermal imager back in the day when they were still really expensive and far from what they are capable nowadays. This is precisely for a lot of people when talking about thermal cameras the images from the movie pop up in their heads, especially the first one, even though thermal imagers were used in most of the sequels after that, though some apparently resorted to “faking” it with CG as well. There is a common misconception about thermal imaging cameras and that is regarding what kind of information they actually record with a lot of people thinking that the colorful image they see is actually what a thermal camera records. Well, maybe even that Predator movie is partially responsible for that misconception, but thermal imaging cameras actually do not record any color information. The reason for that is pretty simple – they do not operate like regular cameras that work in the part of the electromagnetic spectrum that is visible (400–700 nm range) and we can distinguish colors in, they operate in the a much higher part of the electromagnetic spectrum (8000–15000 nm). Thermal cameras record infrared radiation emitted from objects and save it as a temperature information and not color information, this means that each pixel does not have RGB values associated with it that represent certain color, but instead has a temperature value. You can think of this as being more like a grayscale image where the lighter a pixel is, the hotter it normally is, though that is just an example representation. The example with grayscale is also what different color representations of thermal images also do, like in the movie Predator, to make things seem easier to understand a LUT or a lookup table of colors is being used where different temperatures are represented by different colors. I’ll get in more details in a separate post, just want to tell you that the Predator movie for example uses the so called Rainbow lookup table to represent the difference in temperature of the objects in a frame. Another common misconception about the thermal imagers or cameras is that they are “infrared cameras”, but that is not entirely true and is a confusing term to describe them, even though they actually do work in a part of the infrared spectrum. The term infrared camera is mostly used to describe regular digital cameras or even security cameras with night vision that are designed to be more sensitive in the near infrared region of the electromagnetic spectrum (over 700nm to about 1000nm). Thermal imaging cameras operate in a much higher part of the infrared range or the so called Long-wavelength infrared region of about 8000 to 15000 nm. Regular digital camera sensors are not sensitive enough to even reach close to this region, that is why thermal imaging cameras do rely on special type of sensors and not on regular CCD or CMOS sensors used in consumer cameras. This is also the reason why thermal cameras are much more expensive than a regular digital cameras, though in the last few years they have started becoming more affordable and accessible to regular users and not only to professionals that use them for work. Here is a list of some more affordable thermal imaging cameras that you can purchase and play with without having to pay too much to get your hands on the technology. Of course there are some limitations that you can expect such as the lower resolution of the thermal imager and the low framerate you will get if the camera is capable of recording videos. 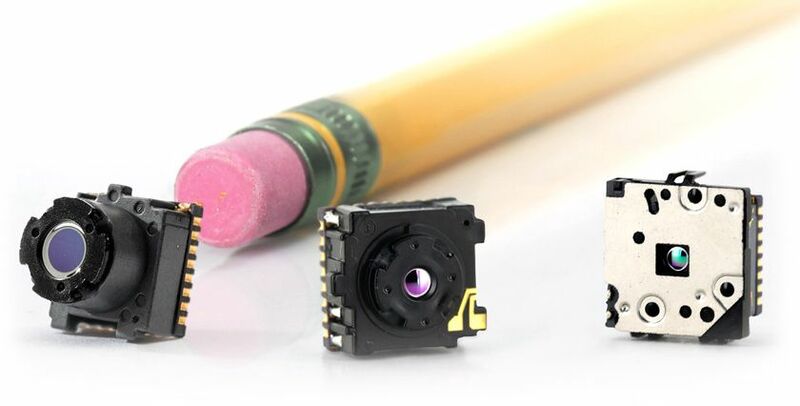 The recent spike in interest in thermal cameras was pretty much caused by the availability of inexpensive sensors such as FLIR Lepton for example. These small and inexpensive sensors quickly found their way into accessories for mobile phones that add thermal vision capabilities to your device. The fact that the phone takes the role of processing and display device allows to greatly reduce the extra cost of these thermal imaging devices as compared to traditional all-in-one solutions. I have been using standalone thermal imaging cameras in my work for a few years already and when the first FLIR One came out I was really curious how well it would work, so I did not wait much to get one. Back in the time it was pretty much the first thermal imaging smartphone accessory that relied on the first generation of FLIR Lepton sensor to come out on the market (80×60 pixels thermal resolution). The product was initially designed only for Apple’s iPhone 5/5S as it came in a special accessory case that attached only to these iOS devices. There were a couple of interesting features available that were introduced with it that were new to the not so high-end thermal imaging cameras that were available back then. These included the ability to actually record thermal videos with it (low resolution and framerate), but still something that is not yet available to the more affordable standalone thermal cameras. This was possible thanks to using the pretty fast processing power of the iPhone to work with the data captured with the sensor. The other one is the ability to record two images and superimpose them in order to create a higher-resolution looking end result, the lower resolution thermal image gets upscaled and on top of it a higher resolution visual image is overlaid providing contour of actual objects. 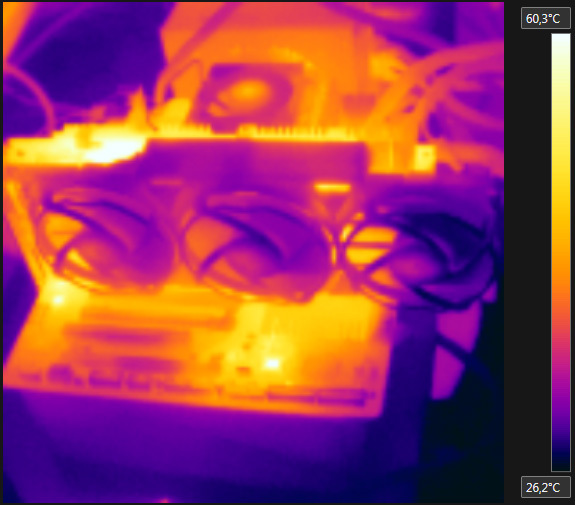 The end result of the so called FLIR MSX blending gives the impression of actually using a higher resolution thermal imager than what you actually have in terms of thermal imager resolution. 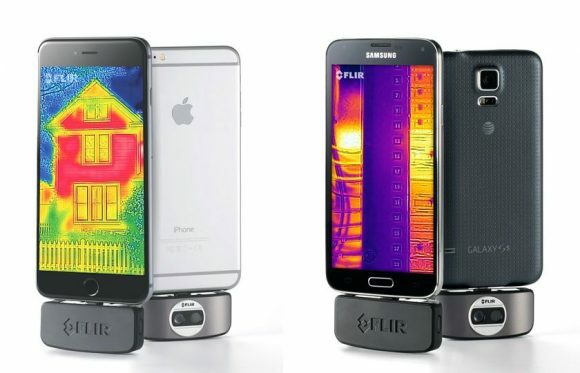 The second generation FLIR One Thermal Imager that was introduced later on was made to be compatible with a wider array of devices and not be fixed only for a specific brand and model(s) of smartphones like the first gen. It became available in a more compact form and available in separate versions for both iOS and Android devices. It also offered some slight improvement in the specifications such as higher temperature sensitivity and apparently a better thermal resolution, not to mention the much more convenient and smaller size of the whole thing that you can easily carry in your pocket for example. The other main player in the smartphone accessory thermal imaging cameras was a company called Seek Thermal introducing their Seek Thermal Compact smartphone accessory to rival the FLIR product. Back when they did this their product was more advanced in terms of specifications and came in a more compact fork with different versions for iOS and Android OS available, but still had some trouble getting popular initially. 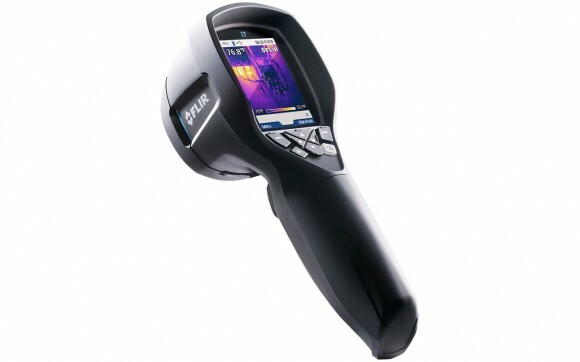 The reason for that is in the fact that FLIR is one of the specialists and the most talked about name in the thermal imaging cameras for professional use, so a tough competitor. There were however some other issues that Seek thermal had, such as the initial availability of their products only for the US market and the not so good performance of their first product even it being with better specs. The last reason was one of the most important as while FLIR has many years of experience and just used it in their consumer product in terms of hardware and software as well, Seek Thermal was really new to the whole thing and needed some time to polish things up. At the moment Seek Thermal is doing much better with multiple product offerings with different specifications and for different user needs, including a more professional solution with even higher resolution thermal imaging sensor, manually focusable lens, higher refresh rate and so on. The company has also managed to polish their software as well in the meantime, so that it is more usable and provides better results than initially had. 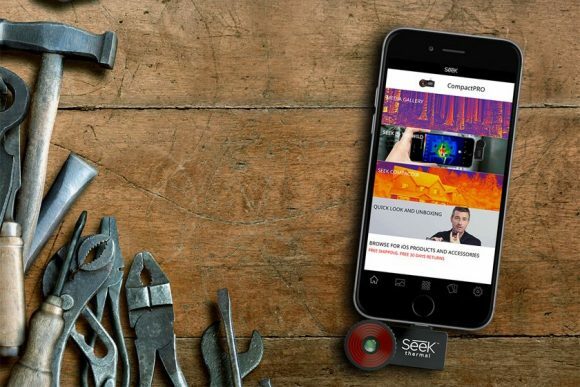 So if you are interested in thermal imaging cameras and being able to add such functionality to your smartphone you might want to also check Seek Thermal as well and not only what FLIR offers. When we are talking about a thermal camera that is designed to be used together with a smartphone or a tablet we presume that it needs to be a low-end and affordable solution. Well, that is not always the case as we can see with the Therm-App from the Israeli company Opgal. 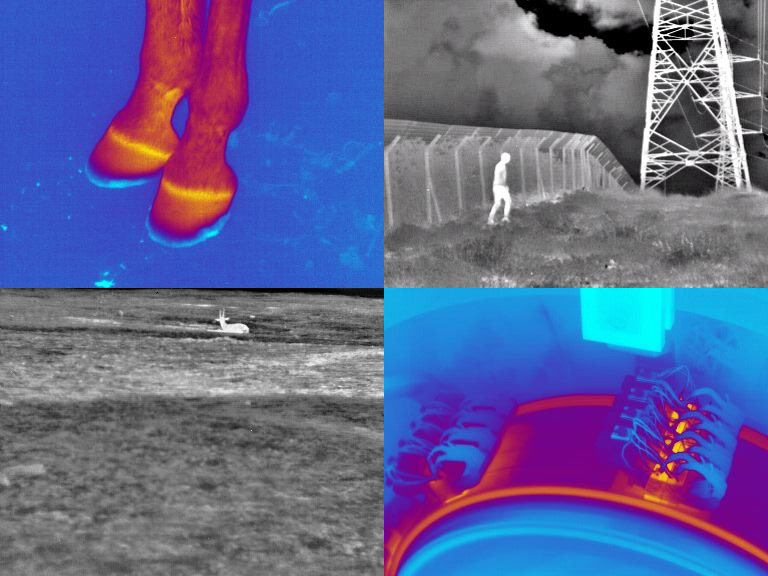 The main goal of the Therm-App accessory for Android mobile devices is to turn smartphones into powerful thermal cameras, featuring high-resolution thermography and long range, enhanced night vision capabilities. The Therm-App comes with a thermal imager with a resolution of 384×288 pixels that previously was only available on standalone professional thermal imaging cameras and thermography devices. 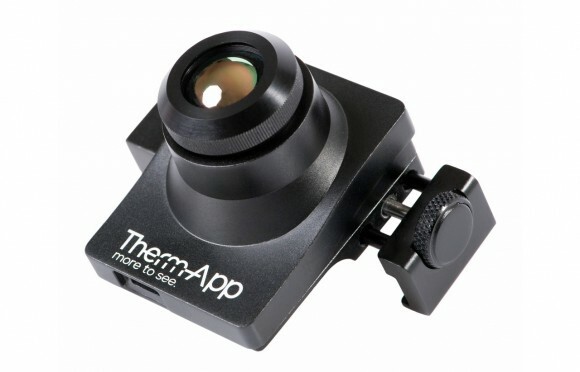 The lightweight and compact Therm-App device fits multiple phone models. It can also be mounted on any tripod or camera handle using its standard connector. With its interchangeable lenses system, the Therm-App device provides effective detection of faraway targets through its long range (19mm) lens, and a wider view through its 6.8mm lens. Its 8.7Hz FPS version is export license free. The only thing that you might not like much about this accessory is the price, it is currently available for $1600 USD, though for the resolution and features it offers you canot expect it to be very cheap. 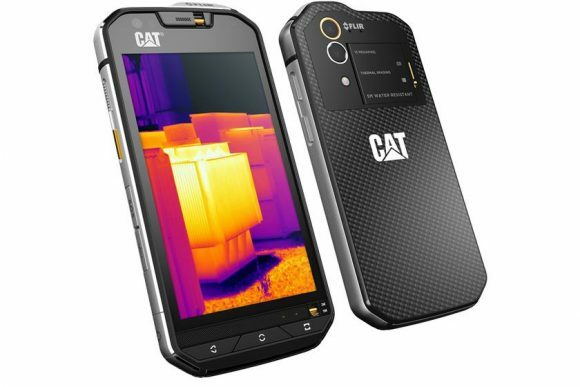 Specifications wise there is one important thing worth mentioning that can be considered as a bit of a disadvantage – the temperature range that the thermal camera accessory can detect. The operating range of just 5 to 90 degrees Celsius is pretty limiting and with a larger resolution thermal imaging sensor we kind of expected to see a wider detection range available as well, especially considering the price of the Therm-App device. Other than that the device does look pretty cool with its design allowing the user to also swap lenses depending if a longer or shorter detection range is required – based on the kind of use you are planning to go for. The sample thermal images captured with the high resolution thermal imaging sensor do look very nice in their original resolution and with some interpolation they they be perfect for use for visualizations and thermal reports, that is if the temperature range of the Therm-App is enough for your needs. A thermographic camera, often also referred to as infrared camera (could be confused with digital cameras modified to take photos only in the infrared light spectrum), thermal imaging camera or just thermal camera is similar in design and functionality to a common digital camera, however there are some important differences. 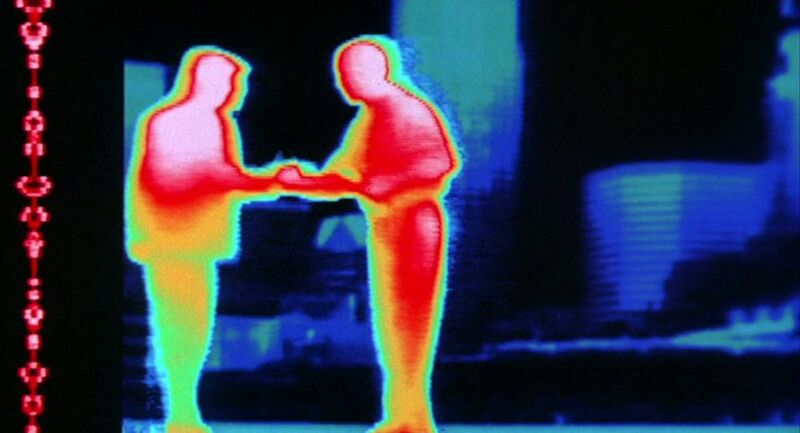 While most common digital cameras operate in the very narrow range of the visible light and barely touching some of the “invisible” Ultraviolet and Infrared ranges, thermal cameras operate in the invisible for the human eye infrared range and they can cover a really wide part of the electromagnetic spectrum. The process of taking thermal images with an thermal camera is referred as thermography and what the cameras essentially do is record the level of infrared radiation that an object emits. Thing get even better, because for taking thermal images you do not need to have visible light – thermal cameras can detect the emitted infrared radiation of objects in total darkness and thus their potential for different uses is extended even further. The thermal imaging sensors used in thermographic cameras do not distinguish colors as they are not operating in the visible light spectrum as we have already said, instead they record the level of infrared radiation emitted from the objects that the camera is pointed at. This essentially produces a monochromatic image with the intensity of a pseudo color representing different temperature (this type of visualization is often used in security thermal cameras). This however is not as easy to distinguish when you need to do thermal analysis, so various alternative methods of representation using false colors representing the difference in temperature as usually used. The most common visualizations of thermal images use black for the coldest areas, then going blue and purple for slightly hotter areas, the mid-range of temperatures is usually red, orange and yellow and going to white for the hottest parts. These false color visualizations usually do come with a small scale next to the image that show the colors used and what temperature the respective color stands for. Usually thermal images are with a much lower resolution if you compare to what number of pixels the modern digital cameras provide, the reason is that the sensors used in thermal imaging cameras are much more expensive than what a sensor for recording the visible light costs. For example a 160×120 or 320×240 pixels thermal imaging sensors can be considered quite good and these usually are found in thermographic cameras that cost a few thousand dollars while as comparison we are already using multi-megapixel digital cameras in our smartphones with much higher resolution. Another important difference with thermal imaging cameras is that recording video is usually found in very high-end and pretty expensive models, it is not a common thing that you can find available on a more affordable thermal camera. Even if you manage to get a thermal imaging camera that supports video recording the chances are that it will record video at a much lower framerate than you probably are used in seeing in a normal video shot with a digital camera.